This identity of speed and performance is evident in the design of the three-hand and chronograph Racing Bird watches. 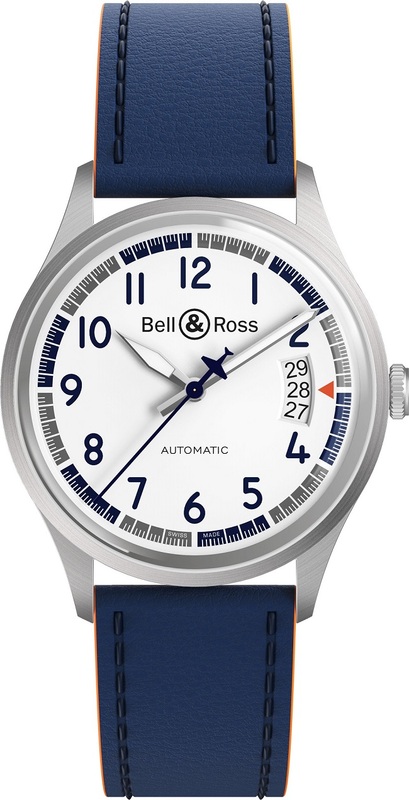 These timepieces share their aesthetic choices with the racing aircraft designed by the Bell & Ross studio, particularly the color code: The dial is white, like the fuselage of the plane. 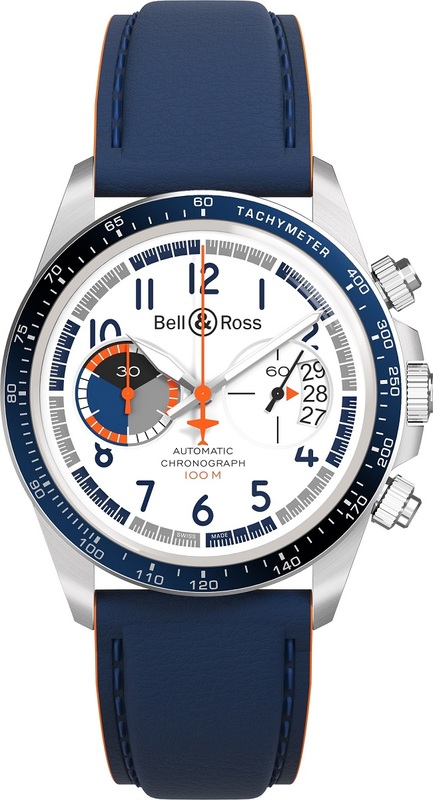 The numerals, bezel, chronograph counter and strap are blue, like the empennage and decorative elements tracing the aerodynamic lines of the BR-Bird. The central second hand, details on the dial and lining of the leather strap are orange, like the color highlighting the most important information on the flight instruments. The timer is grey, reminiscent of the chequered flag used in speed competitions, like the Bell & Ross logo on the wings and flanks of the aircraft. On the dial, the numerals use the same typography as the on- board counters, and the date window shows three numerals–a direct reference to flight instrumentation. The final touch is the silhouette of the aircraft on the case back and at the base of the second hand (on the three-hand version) and the second timer (on the chronograph version). With a 38.5 mm steel case for the BRV1-92 and a 41 mm for the BRV2-94, both versions are powered by a self-winding mechanical movement. With their graphic design and style, these limited edition BRV1 and BRV2 Racing Bird watches are starting a new chapter in a saga that weaves together Bell & Ross and aviation history, performance, extreme professionals… and passion.